MY SECOND DAUGHTER phoned the other day, just to talk. The conversation turned to Easter, which she will celebrate alone or in a Wisconsin hospital. She’s a Spanish medical interpreter and will be on call on Easter. “Are you sending me a chocolate bunny?” she asked. I guess I am now, I thought, then the next day purchased and mailed a chocolate bunny. That got me thinking about Easter traditions, like the chocolate bunnies we give our kids. And dying eggs. And Easter morning church services. And Easter egg hunts, once a part of extended family Easter dinners, now in the past as we don’t all gather anymore. Traveling through Madison Lake last weekend, I noticed this sign for an Easter egg hunt. But many communities still have community Easter egg hunts, like the one held at the Rice County Fairgrounds in Faribault last weekend and the one this morning on the campus of Shattuck-St. Mary’s School. 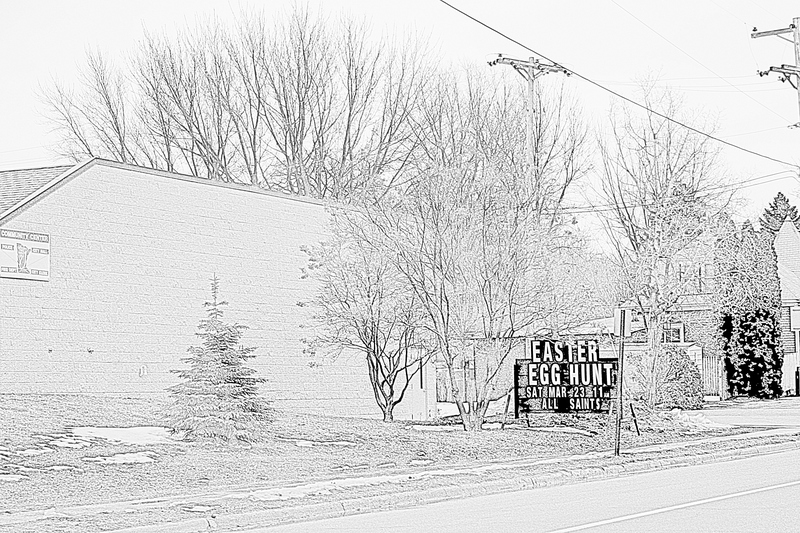 I remember, as a child, participating once in an Easter egg hunt at the Redwood Falls High School football field several blocks from by grandpa’s house. We searched for hard-boiled dyed eggs, not flimsy plastic orbs manufactured in China. The finders of the few golden eggs each received a dollar bill. The rest of us got, well, boiled eggs. And we were happy. I heard on the radio yesterday that the city of Richfield had a problem with theft at this year’s egg hunt. Seems the squirrels nabbed some of the eggs. That does not surprise me. I recall watching a squirrel steal my niece’s pink plastic egg during an Easter egg hunt many years ago. She was practically in tears. Over an egg.